Restaurant managers and owners can develop very strong relationships with quality repair and restoration professionals. And they should; having a leather, vinyl, and color restoration specialist in your back pocket is a crucial element to your profitability in a business with so much wear and tear on your bottom line. Full-service professionals can repair the deepest cracks, rips and tears to leather and vinyl surfaces, leaving them looking like new. Been there. Done that. We've all sat at a booth or table at a restaurant and noticed that there are rips, tears, or even potentially ages old cigarette burns (in the case of "vintage" joints). At any rate, something is in dire need of repair. And there's nothing worse than sitting at a booth or bench that that rips and cracks below your legs or a table that has deep scratches or chips in your eating area. You may have also been in restaurants that have excessive sun damage on chairs, window treatments and other areas, making the space you are sitting in feel old and dated. It takes your experience right down the tubes. If you're a restaurant owner or manager, then this is just part of the gig. Certain areas of a dining room can really suffer from wear and tear of high customer traffic. The cost of replacing these items, unfortunately, can be brutally expensive when you consider how many booths, tables, and chairs sustain damage and wear throughout a restaurant's lifetime. So how does one reduce the massive expensive of operational wear and tear in the restaurant business? That's where Color Glo International comes in. As a solution to this common problem, many restaurant owners are partnering with companies that repair and restore damage to vinyl, leather and plastic surfaces. It can literally save your business hundreds or thousands of dollars in replacement costs depending on the size of your restaurant, and especially over time. In some of our customer case studies, we find that restaurants have 5 or more booths with rips and tears, vinyl upholstery in need of major repair and other blemishes in high traffic areas. While it's certainly true that any restaurant builds its reputation on service and food offerings, customers also want a comfortable dining environment. There is certainly no charm or warm and fuzzy feelings that come from a space that is in disrepair. Can I afford to replace old/worn items? Do I have the time, tools and patience/skillsets to tackle it on my own? Likely not, on both accounts. Repair and restoration specialists can come in during non-business hours and do restoration work on-site, typically within one day depending on your needs. Many restaurant owners believe that when they buy seating and other wearable surfaces for their restaurant that they are buying a timeline of durability. They think that when they rip or tear, they need to replace these items. This often causes them to sit unaddressed, due to the high cost of replacement. Full-service restoration professionals can repair deep rips, cracks, and tears to leather and vinyl surfaces. The repair and restoration work makes these surfaces look like brand new, which is just as good as a full replacement. You won't wait for ordering, shipping, installation or any of the other costs associated with replacement. In fact, you'll probably spend less than half of the cost repairing and restoring what you already own. Ultimately, it's a business decision. If you could repair to a new state at a fraction of the price of replacement, why wouldn't you consider this option? Consider this mathematical example. If you're an owner of a chain or you manage a group of restaurants, this is where the savings can become grossly apparent. If one booth costs $100 to repair vs. $600 to replace and you have 7 locations with an average of 8 booths that require attention, you've just saved $28, 000. You also didn't have to wait for supplies, installation or any other tedious tasks along the way. Your business operates as normal and takes on a transformation during non-operating hours of the day. One of most valued partners you can have in the service industry is one that focuses on restoration and repair of your high-traffic and wear/tear areas. There is no doubt that it is really important to maintain your restaurant's appearance and comfort in order for your guests to return time after time again. Since the cost of operating and repairing restaurants continues to reach exorbitant levels, many restaurateurs have become increasingly savvy by making smart alliances with restoration specialists that perform work on regular basis. This ensures that areas of concern are being addressed quickly before they become more expensive repairs or very unsightly for their clientele. Today, your reputation management is an area of concern in multiple areas. Keeping your space in top condition for your guests will keep them coming back; this is directly managed by you. But it also keeps your customers from leaving negative or poor reviews online and elsewhere around the internet. Your reputation management online might be handled by your favorite digital marketing company, but it starts inside your doors. Color Glo International can help you stay on top of your reputation with a quality service that is convenient and timely, all the while saving plenty of dollars on the bottom line. Does your restaurant need a facelift? 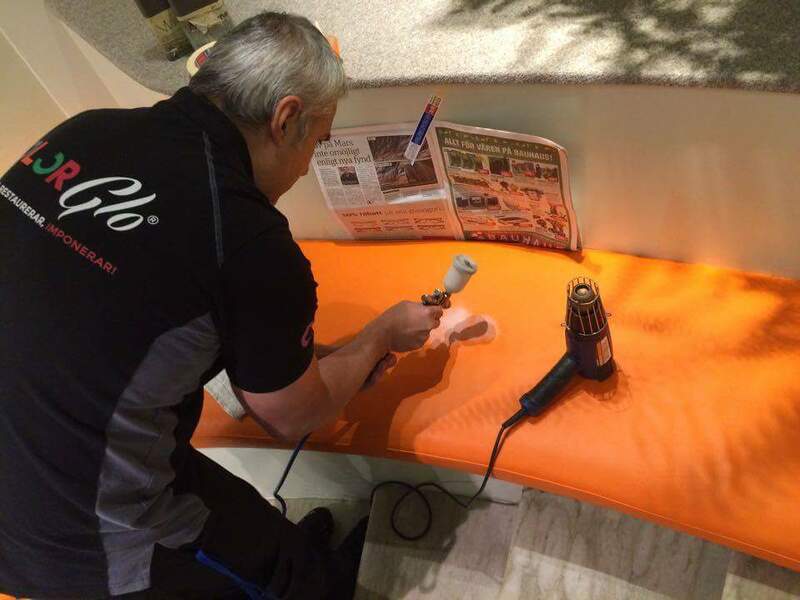 If your booths, chairs and other leather or vinyl surfaces are in serious need of repair and your image is not as compelling as it was the day you opened your doors, then find a Color Glo Specialist to help design a repair/restoration schedule to maintain your reputation.